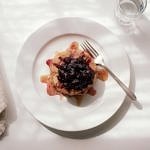 Moist and fluffy pancakes with warm blueberry compote make a great way to start the day! If using a flax egg, place ingredients in small bowl and set aside for about 10 minutes to set. This is optional. I have made pancakes many times without the need for an egg replacement but you can think of it as added nutrition as flax meal is very good for you! Compote: Place small saucepan over medium heat. Add blueberries, sugar, lemon/orange juice and zest, bring to a simmer, mashing the berries with the back of a spoon. Once warm, bubbly and thickened, remove from heat and set aside, about 10 minutes. Pancakes: Preheat griddle or pan to medium heat. Combine the flour, oats, sugar, baking powder and salt in a large bowl. In a small bowl, whisk together the buttermilk, flax egg, vanilla and coconut oil. Add wet ingredients into the dry mixture and blend until just combined. Using a 1/4 cup measuring cup, scoop and pour pancake mix onto a lightly greased griddle or skillet. Cook until bubbles form along the top and edges, about 2 to 3 minutes…bottom should be golden brown. Carefully flip and cook for another 2 minutes or so until golden brown underneath. Makes about 8 small pancakes. Serve: Serve warm with blueberry compote and pure maple syrup. If you don’t care for whole oats in your pancakes (like my daughter), you can process them to be a finer consistency or use the quick oats since they are a bit smaller. I have made the compote with lemon and orange juice and zest. Both ways were equally delicious!